Today more DevOps teams are leveraging the power of containerization, and technologies like Kubernetes and Red Hat OpenShift, to manage containerized database clusters. To support teams building cloud-native apps with Kubernetes and OpenShift, we are introducing a Kubernetes Operator (beta) that integrates with Ops Manager, the enterprise management platform for MongoDB. The operator enables a user to deploy and manage MongoDB clusters from the Kubernetes API, without having to manually configure them in Ops Manager. With this Kubernetes integration, you can consistently and effortlessly run and deploy workloads wherever they need to be, standing up the same database configuration in different environments, all controlled with a simple, declarative configuration. Operations teams can also offer developers new services like MongoDB-as-a-Service, that could provide for them a fully managed database, alongside other products and services, managed by Kubernetes and OpenShift. If you ever visited an international shipping port or drove down an interstate highway you may have seen large rectangular metal containers generally referred to as intermodal containers. These containers are designed and built using the same specifications even though the contents of these boxes can vary greatly. The consistent design not only enables these containers to freely move from ship, to rail, and to truck, they also allow this movement without unloading and reloading the cargo contents. This same concept of a container can be applied to software applications where the application is the contents of the container along with its supporting frameworks and libraries. The container can be freely moved from one platform to another all without disturbing the application. This capability makes it easy to move an application from an on-premise datacenter server to a public cloud provider, or to quickly stand up replica environments for development, test, and production usage. MongoDB 4.0 introduces the MongoDB Enterprise Operator for Kubernetes which enables a user to deploy and manage MongoDB clusters from the Kubernetes API, without the user having to connect directly to Ops Manager or Cloud Manager (the hosted version of Ops Manager, delivered as a service. While MongoDB is fully supported in a containerized environment, you need to make sure that the benefits you get from containerizing the database exceed the cost of managing the configuration. As with any production database workload, these containers should use persistent storage and will require additional configuration depending on the underlying container technology used. To help facilitate the management of the containers themselves, DevOps teams are leveraging the power of orchestration technologies like Kubernetes and Red Hat OpenShift. While these technologies are great at container management, they are not aware of application specific configurations and deployment topologies such as MongoDB replica sets and sharded clusters. For this reason, Kubernetes has Custom Resources and Operators which allow third-parties to extend the Kubernetes API and enable application aware deployments. Later in this blog you will learn how to install and get started with the MongoDB Enterprise Operator for Kubernetes. First let’s cover MongoDB Ops Manager, which is a key piece in efficient MongoDB cluster management. Ops Manager is an enterprise class management platform for MongoDB clusters that you run on your own infrastructure. 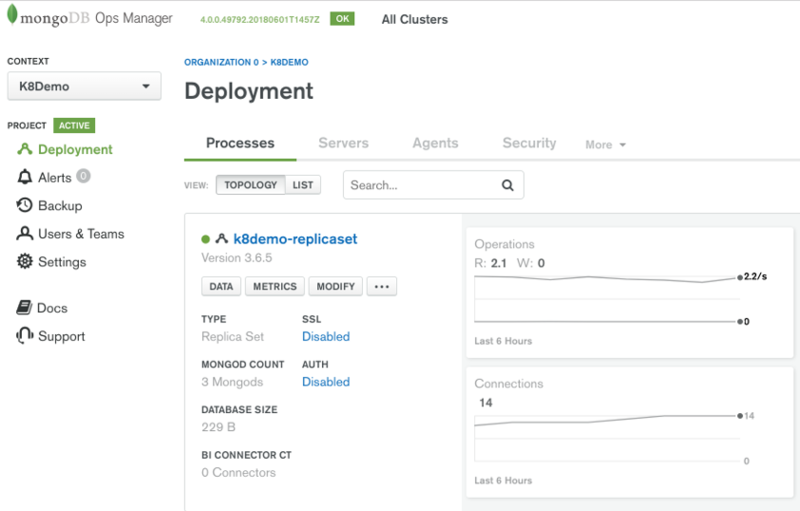 The capabilities of Ops Manager include monitoring, alerting, disaster recovery, scaling, deploying and upgrading of replica sets and sharded clusters, and other MongoDB products, such as the BI Connector. While a thorough discussion of Ops Manager is out of scope of this blog it is important to understand the basic components that make up Ops Manager as they will be used by the Kubernetes Operator to create your deployments.. The MongoDB HTTP Service provides a web application for administration. These pages are simply a front end to a robust set of Ops Manager REST APIs that are hosted in the Ops Manager HTTP Service. It is through these REST APIs that the Kubernetes Operator will interact with Ops Manager. With a typical Ops Manager deployment there are many management options including upgrading the cluster to a different version, adding secondaries to an existing replica set and converting an existing replica set into a sharded cluster. So how does Ops Manager go about upgrading each node of a cluster or spinning up new MongoD instances? It does this by relying on a locally installed service called the Ops Manager Automation Agent which runs on every single MongoDB node in the cluster. This lightweight service is available on multiple operating systems so regardless if your MongoDB nodes are running in a Linux Container or Windows Server virtual machine or your on-prem PowerPC Server, there is an Automation Agent available for that platform. The Automation Agents receive instructions from Ops Manager REST APIs to perform work on the cluster node. When Ops Manager shows statistics such as database size and inserts per second it is receiving this telemetry from the individual nodes running MongoDB. Ops Manager relies on the Monitoring Agent to connect to your MongoDB processes, collect data about the state of your deployment, then send that data to Ops Manager. There can be one or more Monitoring Agents deployed in your infrastructure for reliability but only one primary agent per Ops Manager Project is collecting data. Ops Manager is all about automation and as soon as you have the automation agent deployed, other supporting agents like the Monitoring agent are deployed for you. 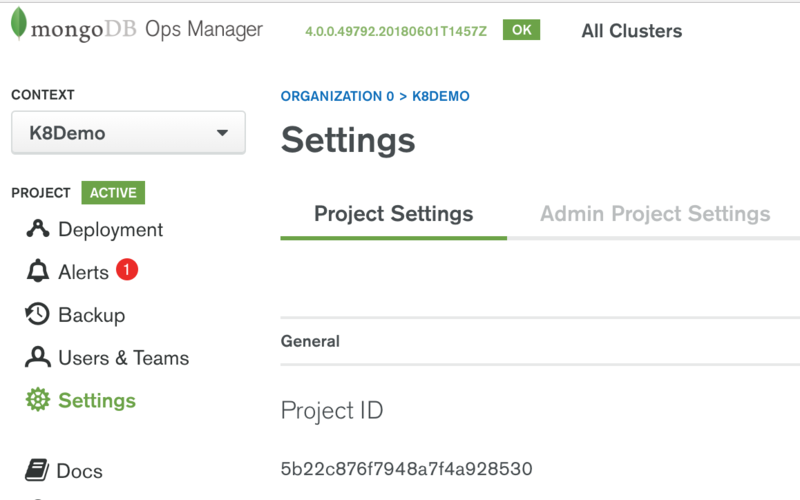 In the scenario where the Kubernetes Operator has issued a command to deploy a new MongoDB cluster in a new project, Ops Manager will take care of deploying the monitoring agent into the containers running your new MongoDB cluster. Ops Manager is an integral part of automating a MongoDB cluster with Kubernetes. To get started you will need access to an Ops Manager 4.0+ environment or MongoDB Cloud Manager. The MongoDB Enterprise Operator for Kubernetes is compatible with Kubernetes v1.9 and above. It also has been tested with Openshift version 3.9. You will need access to a Kubernetes environment. If you do not have access to a Kubernetes environment, or just want to stand up a test environment, you can use minikube which deploys a local single node Kubernetes cluster on your machine. For additional information and setup instructions check out the following URL: https://kubernetes.io/docs/setup/minikube. To install the MongoDB Enterprise Operator for Kubernetes you can use helm, the Kubernetes package manager, or pass a yaml file to kubectl. The instructions for both of these methods is as follows, pick one and continue to step 2. At this point the MongoDB Enterprise Operator for Kubernetes is installed and now needs to be configured. First, we must create and apply a Kubernetes ConfigMap file. A Kubernetes ConfigMap file holds key-value pairs of configuration data that can be consumed in pods or used to store configuration data. In this use case the ConfigMap file will store configuration information about the Ops Manager deployment we want to use. Base Url - The URL of your Ops Manager or Cloud Manager. Project Id - The id of an Ops Manager Project which the Kubernetes Operator will deploy into. If you already know how to obtain these follows copy them down and proceed to Step 3. The Base Uri is the URL of your Ops Manager or Cloud Manager. Copy down the value displayed in the URL To Access Ops Manager box. Note: If you don’t have access to the Admin drop down you will have to copy the Url used to connect to your Ops Manager server from your browser's navigation bar. The Project Id is the id of an Ops Manager Project which the Kubernetes Operator will deploy into. An Ops Manager Project is a logical organization of MongoDB clusters and also provides a security boundary. One or more Projects are apart of an Ops Manager Organization. If you need to create an Organization click on your user name at the upper right side of the screen and select, “Organizations”. Next click on the “+ New Organization” button and provide a name for your Organization. Once you have an Organization you can create a Project. To create a new Project, click on your Organization name. This will bring you to the Projects page and from here click on the “+ New Project” button and provide a unique name for your Project. If you are not an Ops Manager administrator you may not have this option and will have to ask your administrator to create a Project. Once the Project is created or if you already have a Project created on your behalf by an administrator you can obtain the Project Id by clicking on the Settings menu option as shown in the Figure below. To see the list of Ops Manager users return to the Project and click on the “Users & Teams” menu. You can use any Ops Manager user who has at least Project Owner access. If you’d like to create another username click on the “Add Users & Team” button as shown in Figure 6. Copy down the email of the user you would like the Kubernetes Operator to use when connecting to Ops Manager. The Ops Manager API Key is used by the Kubernetes Operator to connect to the Ops Manager REST API endpoint. You can create a API Key by clicking on your username on the upper right hand corner of the Ops Manager console and selecting, “Account” from the drop down menu. This will open the Account Settings page as shown in Figure 7. Click on the “Public API Access” tab. 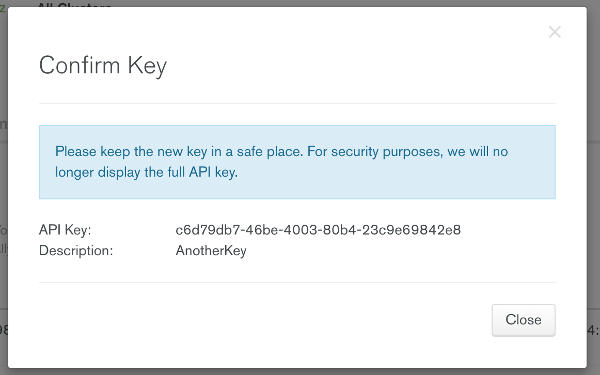 To create a new API key click on the “Generate” button and provide a description. Upon completion you will receive an API key as shown in Figure 8. Be sure to copy the API Key as it will be used later as a value in a configuration file. It is important to copy this value while the dialog is up since you can not read it back once you close the dialog. If you missed writing the value down you will need to delete the API Key and create a new one. Note: If you are using MongoDB Cloud Manager or have Ops Manager deployed in a secured network you may need to whitelist the IP range of your Kubernetes cluster so that the Operator can make requests to Ops Manager using this API Key. Now that we have acquired the necessary Ops Manager configuration information we need to create a Kubernetes ConfigMap file for the Kubernetes Project. To do this use a text editor of your choice and create the following yaml file, substituting the bold placeholders for the values you obtained in the Ops Manager console. For sample purposes we can call this file “my-project.yaml”. Note: The format of the ConfigMap file may change over time as features and capabilities get added to the Operator. Be sure to check with the MongoDB documentation if you are having problems submitting the ConfigMap file. For a user to be able to create or update objects in an Ops Manager Project they need a Public API Key. Earlier in this section we created a new API Key and you hopefully wrote it down. This API Key will be held by Kubernetes as a Secret object. kubectl -n mongodb create secret generic <<Name of credentials>> --from-literal="user=<<User>>" --from-literal="publicApiKey=<<public-api-key>>"
Make sure you replace the User and Public API key values with those you obtained from your Ops Manager console. You can pick any name for the credentials – just make a note of it as you will need it later when you start creating MongoDB clusters. Now we're ready to start deploying MongoDB Clusters! The name of your new cluster can be any name you chose. The name of the OpsManager Project config map and the name of credentials secret were defined previously. After a few minutes your new cluster will show up in Ops Manager as shown in Figure 11. Notice that Ops Manager installed not only the Automation Agents on these three containers running MongoDB, it also installed Monitoring Agent and Backup Agents. What good would a database be if anytime the container died your data went to the grave as well? Probably not a good situation and maybe one where tuning up the resumé might be a good thing to do as well. Up until recently, the lack of persistent storage and consistent DNS mappings were major issues with running databases within containers. Fortunately, recent work in the Kubernetes ecosystem has addressed this concern and new features like PersistentVolumes and StatefulSets have emerged allowing you to deploy databases like MongoDB without worrying about losing data because of hardware failure or the container moved elsewhere in your datacenter. Additional configuration of the storage is required on the Kubernetes cluster before you can deploy a MongoDB Cluster that uses persistent storage. In Kubernetes there are two types of persistent volumes: static and dynamic. The Kubernetes Operator can provision MongoDB objects (i.e. standalone, replica set and sharded clusters) using either type. Connecting to MongoDB deployments in Kubernetes is no different than other deployment topologies. However, it is likely that you'll need to address the network specifics of your Kubernetes configuration. To abstract the deployment specific information such as hostnames and ports of your MongoDB deployment, the Kubernetes Enterprise Operator for Kubernetes uses Kubernetes Services. Note the appended string "-svc" to the name of the replica set. The service with "-external" is a NodePort - which means it's exposed to the overall cluster DNS name on port 30057. Now that we know the IP of our MongoDB cluster we can connect using the Mongo Shell or whatever application or tool you would like to use. Another common troubleshooting technique is to shell into one of the containers running MongoDB. Here you can use common Linux tools to view the processes, troubleshoot, or even check mongo shell connections (sometimes helpful in diagnosing network issues).